I found this recipe by googling. It goes well on sugar cookies. It's also tasty on a spoon, beaters, a spatula, the counter top, etcetera... The recipe comes from Oprah.com. The picture was taken by me. Cream the butter in a medium-size bowl until very smooth. Stir in the vanilla-bean seeds until they're evenly distributed. Add the salt and milk, and stir until combined. Sift the sugar over the butter mixture and stir the mixture until it's perfectly smooth. If the frosting is too loose, add a few more tablespoons of confectioners' sugar, and stir until smooth. Cover with plastic wrap until you're ready to use; mix well just before using. Notes: I just dumped everything together and beat it up with a hand mixer and it turned out great. Hmm that is a good idea and one I hadn't thought about. Thank-you. Vanilla frosting is the best, and yours looks incredible. Thanks for sharing! These look amazing, what kind of cookie did you use? 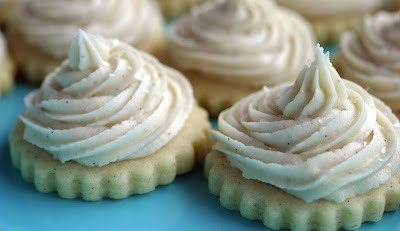 I used the "Rich Rolled Sugar Cookies" recipe from Joy of Cooking Christmas Cookies. Any sugar cookie dough for cutouts would probably have similar results. Adorable cookie shapes too. Thanks for considering giving us photography tips!